I am about to show you how out of the loop I am – in case I haven’t made it abundantly clear already. Have you seen these bikes? All over the place? It seems to be the only type of bike boys ride these days. 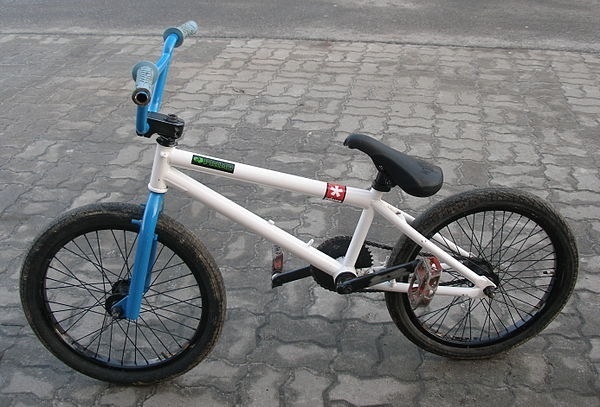 These type bikes are intended for BMX. Racing on uneven surfaces and for tricks. Jumping dirt hills and feeling RAD. This bike is supposed to make it happen. But I don’t see kids performing tricks, I see them riding these bikes to school. And it looks hard. As someone who has taught indoor cycling for 10 years, all I can see in this picture is the small distance between the seat and the pedals. I have been trained to teach students where to place their seats and handle bars for the most efficient and safe pedal stroke – and this is not the height! When you only have a slight bend in the knee at the bottom of your rotation, you pull in more muscles in the leg to help you push and reduce the wear and tear on your knees. This morning, I saw 2 children riding up hill to school on these bikes. They were sitting in the saddle with their knees practically bruising their chins with each pedal stroke. It not only looked hard, but ridiculous. Sometimes dealing with the ins and outs of Dravet Syndrome can feel like cycling up hill. Even though we are heading some where, it’s really hard. I’m so thankful that I am fitted with the proper equipment for the battle (Ephesians 6:11-17). You see, walking daily with our Heavenly Father is a lot like having the right fit on your bike. The climbs are hard, but because you have spent time on your knees and your feet are fitted with the Gospel of Peace, you are in the proper position to endure. I honestly don’t know how others survive anything as trying as a catastrophic illness without the peace that comes from knowing Christ. My heart goes out to the famiiies I see posting on social media about a difficult turn of events and asking their friends to send out “positive thoughts”. Although a nice idea, what good can that do anyone? That is like spinning your bicycle wheels and going nowhere. But prayers? My God can answer prayers. Not always exactly as I would like, but he responds to the requests of His people. And that simple fact has been more comfort to me than anything else in my life (family, friends, doctors or medicines) since the day Shelby had her first seizure. Do you know that kind of comfort and peace? Even if you aren’t struggling with an ill child, you can’t live on this earth without your fair share of troubles. Do you know that no matter what happens in this world, God Almighty holds you in the palm of His hand? As you fear for your child’s life or think of your own mortality, what kind of assurances do you have of an afterlife? If this brought up questions for you, please personal message me. I don’t claim to have all the answers, but I know the God who does. I can introduce Him to you and we can seek Him for the answers together. Make today the last day you struggle up your hills alone.